To purchase a concession ticket (£6) please enter the code KITCHEN_CONC at checkout. The Kitchen Rules Longform Drop-In is a weekly drop-in for improvisers who are interested in American-style longform comedic improvisation. Workshops feature a heavy emphasis on scenework fundamentals and establishing truthful, grounded characters with fun comedic patterns. Our drop-ins are currently focusing on finding an appropriate position within an improv scene.This workshop will cover Character Driven Scenes. If a scene opens with a character we should agree with the world it implies and fill it out, for example if someone plays a war veteran it may not be the most supportive move to simply play yourself. At its most basic we can mirror that character, but we can do much more than that but finding different points of views from the same kind of character. In this workshop we will explore the full emotional spectrum that a single character implies to show the range of agreement we can access. These sessions are OPEN TO ALL, but prior scenework experience is recommended. 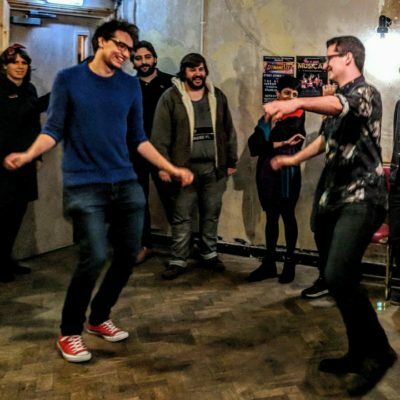 John Gallagher moved to Bristol in 2016 where he joined the Bristol Improv Theatre teaching staff, The Unscripted Players committee, and the Bristol Longform Community. He performs with a number of improv troupes including ‘The Inheritance’, ‘Macronaughts’, ‘Scenes To An End’, ‘The Wentworths’, ‘The Billy Boys’, and his one man show, ‘One Board Man’. John regularly teaches and coaches in Bristol, and has performed at numerous UK venues such as Hoopla, The Free Association, The Nursery, Nottingham Comedy Festival, and The Edinburgh and Brighton Fringe Festivals. He currently works as Production Manager for The Unscripted Players, and as Outreach Director for Kitchen Rules Theatre.